International travel is a chance to learn and to teach that’s both exciting and scary. “The one thing it’s not is a vacation!” said Pixita del Prado, professor of elementary education and reading. Now, thanks to a grant received from the SUNY Office of Diversity, Equity, and Inclusion (ODEI), the School of Education will focus on following up with returning students to build on the new material they have learned and assessing its impact. The grant, “Investing in the Return Process,” is designed to improve the program’s viability and sustainability. Del Prado is coordinating the grant with Nancy Chicola, associate professor emerita, and Tamara Horstman-Riphahn, executive assistant to the dean of the School of Education. Now, however, that international experience has been incorporated into the Professional Development Schools (PDS) consortium of partner schools as the International PDS. And the program has grown in popularity as students return and share their experiences with their friends and classmates. The IPDS program received a competitive $10,000 award, the maximum granted, from ODEI through its Explorations in Diversity and Academic Excellence program for 2017–2018. The grant funds a stipend for a research assistant, Ashley Rogalski, who is pursuing a master’s degree in Buffalo State’s literacy specialist program. “Ashley will be analyzing data collected through surveys and interviews to assess the impact of studying abroad on participants, and to inform program planning and improvement,” said del Prado. Other goals for the research include using students’ blogs (kept while abroad) to analyze how the experience impacts participants’ future studies and careers. One interesting development has been that the IPDS program attracts students from other majors and from diverse backgrounds. It’s possible that IPDS opportunities may be a way to increase diversity among students who want to become teachers. The grant will also provide stipends to two student ambassadors. Bryanna Hill, who is the student ambassador this semester, is pursuing a bachelor’s degree in childhood education. She has traveled to the Dominican Republic and Chile. In spring 2018, Christine Garas will serve as student ambassador. She is an undergraduate studying exceptional education who has traveled to Chile and expects to go to Italy in January 2018. While most participants in the IPDS share their excitement and discoveries with other students, the student ambassadors will do so in a more formal, intentional way. 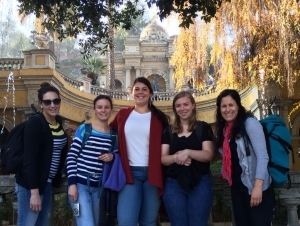 When students and faculty travel to the international sites—currently in Chile, the Dominican Republic, Germany, Italy, Rwanda, and Zambia—they are accompanied by two faculty members who shape the experience in several ways. New sites in China, Spain, and the United Kingdom are in development. Besides preparing the students before the trip, faculty members advise students while abroad so the students make the most of the opportunity to learn, acquire classroom experience, and conduct research. For example, some students compare the host’s education system and classroom activities to those in the United States. Others, immersed in a culture where they don’t speak the language, become sensitized to the challenges English-language learners face. Some students pursue training in teaching English to speakers of other languages. Students who participated in the IPDS presented their research at the recent PDS Conference. Pictured: Buffalo State in Santa Lucia, Chile, 2014. Pixita del Prado is at far right.